The Gray Wars. To dye or not to dye. That is the question in the latest feminist debate over aging and authenticity. Name 10 American female celebrities with gray hair. Umm ... Meryl Streep. But only in character and only occasionally, such as in The Devil Wears Prada. O.K., how about Emmylou Harris and Jamie Lee Curtis ... and that woman on the Food Network, Paula Dean, and ... and ... O.K., but that's show business. Surely there are nationally famous gray-haired women in more workaday fields, in business and politics and the professions? Uhhh ... Barbara Bush? In fact, we have almost no high-profile, female, gray-haired role models. Ironically, it's feminism's success that has driven today's widespread, virtually obligatory camouflage of gray hair. Meg Reggie, 49, a public relations executive in Atlanta, believes having dyed hair is essential to advancing in her career. "Since I am in the image business, it is very important that I look as current as my clients and the products and services they sell and I promote. If I stopped, I think my confidence level would drop, and I would feel at a disadvantage competitively. In the South, if [a woman] is not well maintained and current, one will hear whispers of 'Bless her heart.'" It makes sense that gray hair might be a no-go in the public relations industry, but women in all kinds of professions report feeling similar pressure. Dr. Lillian Schapiro, 43, an ob-gyn in Atlanta, deconstructed the calculus very clearly in her consideration of hair color and professional edge. "People want their physician to look mature but also professional. My male colleagues gain respect with gray. If I kept my hair past my shoulders, as I wear it now, and went gray, I would look like a more alternative doctor. Most people want a conventional doctor. Gray hair on a woman is not conventional." Electoral politics is a professional area in which maturity and gravitas would seem to be among the most important attributes for the job. 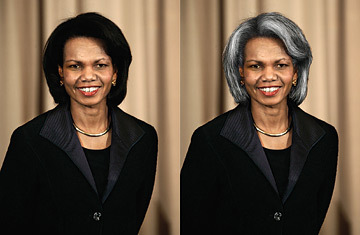 What better way for a woman who might otherwise be viewed as a girly lightweight to convey her experience than by having gray hair? Yet of the 16 female U.S. Senators  the highest number ever  who range in age from 46 to 74, not a single one has visible gray hair. Of the 70 female members of the House, only seven have gray hair. Political professionals say that the double standard is a great unspoken inequity but that candidates and officeholders don't dare publicly discuss it for fear of seeming trivial. In an interview before her death last year, Ann Richards, the famously white-haired former Governor of Texas, told me, "You can't appear to be too flashy because it will send the wrong message, but at the same time, you need to appear energetic. The issue is much more significant for women because the hurdle is higher in our society. We're not sure what we want our [female] elected officials to be  mother, mistress or caretaker." Interestingly, women apparently aren't as fearful of the negative professional implications of gray as the personal ones. Clairol research reports that the 71% of women who dye their hair do so in order to "look and feel more attractive." Another powerful motivator for gray-haired women to dye, according to Clairol's in-house creative director of color and style, Marcy Cona, is to live the fantasy that they're still 30 or 35 instead of 45 or 60. But rather than sell it as a fantasy or a lie ("Is it true blonds have more fun? "), the postmodern beauty industry casts artificial color as a means of expressing a deeper truth about who one is. It's all about "helping each woman create an authentic connection between how she feels internally versus how she looks externally," Cona says. As Rose Weitz, author of Rapunzel's Daughters: What Women's Hair Tells Us About Women's Lives, put it, "Even if, in the abstract, we think we look all right with gray hair, we nonetheless feel as if we are losing our 'real selves' if we no longer have our 'real hair color'  the color we had when we were young and looked our best." We're not talking about the fate of civilization here, but that semantic backflip does seem a little Orwellian. War is peace, freedom is slavery, and the artificial me is the more real me. But Emmylou Harris, the 60-year-old country-rock singer, who has worn her hair gray since her 30s, makes a great case for the real me being just that: real. All men find a "certain attractiveness to being natural," she told me when I interviewed her for my book Going Gray. "When it gets down to the nitty-gritty, when people start getting to know one another and you get into the realm of real human interaction, people want to be interested in the person whom it is comfortable to be with and who is passionate about life. We're all enticed by the physical. That's just biology. But we all know that we are looking for someone to accept us and celebrate us for who we are. Who wants to put on an act 24 hours a day?" For my book, I decided to make myself a guinea pig and put gray hair vs. brown hair to the acid test on Match.com. I assumed that if I accurately reported my age and posted first a photo of myself with gray hair and then, three months later, the same image with brown hair, that the photo with brown hair would be deemed more attractive by more of the Match.com men. I couldn't have been more wrong. Among Match.com-ers in New York City, Chicago and  most shocking of all  Los Angeles, three times as many men were interested in going out with me when my hair was gray as when it was dyed. This blew my mind. Maybe the men sensed that if I was being honest about the color of my hair, I'd be more accessible and easier to date. Or maybe the gray made me stand out from the overwhelming majority of Match.com women my age who color their hair. Coloring hair has been intermittently fashionable for centuries, from Egyptian henna to the white-powdered wigs and hair of the 18th century. But it wasn't until the 1950s  when the baby boomers were being born and big cosmetics marketers introduced easy dyes for home use, advertising them on the new mass medium of television  that American women began to dye their hair en masse. Until then, women who colored their hair risked being considered trampy adventurers. Clairol's 1956 advertising  campaign slogan "Does she or doesn't she?" was specifically designed to remove the stigma attached to Mae West-Jean Harlow-style hair coloring with the reassuring answer: "Hair color so natural, only her hairdresser knows for sure." And American women never looked back. As Nora Ephron  at 66, a proud artificial brunet  puts it in I Feel Bad About My Neck: "There's a reason why 40, 50 and 60 don't look the way they used to, and it's not because of feminism, or better living through exercise. It's because of hair dye." These days, choosing not to dye has become a statement rather than a casual stylistic choice. Thus the gray wars are a bit of a grownup replay of the freaks vs. squares and smart kids vs. populars from junior high and high school 40 years ago. "The emphasis in the 1960s on being yourself gives women today a cultural grounding that lets them say 'Hell, no'" to artificial color, says Weitz. "More women today are more financially independent, and that leads them to a place where they have the resources to do what they want to do." Weitz suggests that because baby boomers represent such a large segment of the population, even though the fraction of gray-haired women who don't dye is relatively small, the absolute numbers will lead to a perception of far more women going gray. "Miranda Priestly, Streep's Prada character, would not have had chic white hair," according to Weitz, "if so many boomer women were not already doing it." Leading-edge boomers' cultural influence has been disproportionate for nearly a half-century, and there's no reason it should stop now.